We are an international guild of talented artists that work hard to promote the art doll industry and to enlighten the public as to how much ART there is in the term Art Doll. 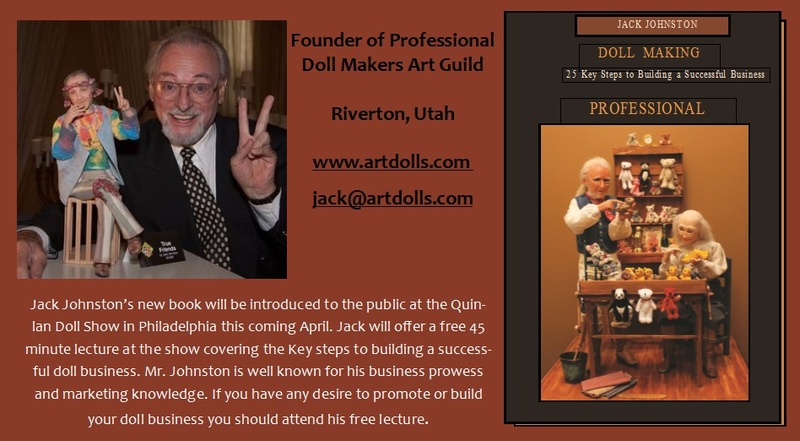 Our Guild’s mission is to showcase and promote the biggest talents and emerging artists from around the world to help them achieve higher levels of success and also work with beginning artists so that they can achieve their dream of becoming a world class art doll maker. Over the past 25 years our Guild has given multitudes of artists a leg up in the world of figurative art which we refer to as Art Dolls. If you want a hand in reaching your goal as a professional artist, Join us today. Whether your a Master doll artist who wants to share your experience of doll making, an artist who wants guidance or a beginner who would love to learn to create art dolls, PDMAG has a place for you. Our artists are the foundation of PDMAG. Specializing in one of a kind or limited artists editions including sculpted Baby, Character, Fantasy, Primitive and Ball Jointed art dolls to name a few. Our calendar of events will keep you informed of upcoming shows, events and classes offered by our members. This is a work in progress and will be updated shortly. Thank you for your patience! Jack Johnston announces the release of his 4th book. Published through Jones Publishing. Subscribe to our newsletter to keep up to date with our latest news and events.